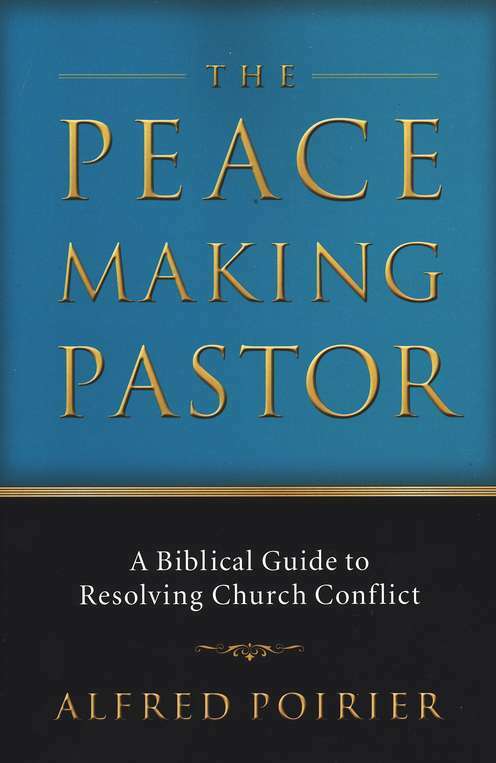 Editor's Note: The following is a report on the practical applications of Alfred Poirier's recent book, The Peacemaking Pastor: A Biblical Guide to Resolving Church Conflict, (Baker Books, 2006). Conflict in church comes in many forms – gossip, controversial staff decisions, sexual scandals, broken business deals between members, and more. As a pastor, you may see conflict as an annoyance to ignore so it doesn’t distract you from your ministry. But dealing with conflict is an important part of your ministry. Jesus calls you to face conflict head-on and work to resolve it. It’s only by embracing your calling as a peacemaker that you can reconcile your congregation to God and each other. * Assess the ways you usually respond to conflict. Ask yourself what you usually do when you encounter conflict. Do you try to escape? Do you attack others? Do you minimize the problem? Do you yell? Do you clam up? Ask your spouse and a close friend to give you their insights into this issue as well, so you can fully understand your current patterns of dealing with conflict. * Confess your own sins before trying to help others. Recognize that you can’t effectively help other people deal with conflict if you have conflict of your own in your heart. Regularly examine your attitudes and behaviors, and confess your sins to keep your heart clean before God while leading your church. Whenever you’re involved in a conflict with someone in your life (such as with a family member), don’t focus on how God can change the other person. Instead, focus on how God can change you. Honestly consider whether or not any of your desires may be in conflict with God’s will for you, and regularly submit yourself to His will for your life. * Rely on God’s generous grace. Remember that you can count on God to give you all the strength you need to work through conflict in your church. Instead of depending on your own limited strength, rely on the unlimited supply of grace God will give you to handle every situation. * Seek God’s purposes. Trust that God will use each conflict in your church to work for the good of everyone involved, as well as for His glory. Ask God to reveal His redemptive purposes behind every conflict you encounter, and pray for each conflict to lead to renewal in your church. Rather than perceiving conflict as an obstacle to your ministry, welcome it as an opportunity to glorify God and see His wisdom and power at work bringing about reconciliation. * Remember that your church is a family. Understand that when you work for peace, you reflect most what it means to be a child of God, since God is always at work reconciling people to Him and each other. Keep in mind that every person in your congregation is a brother or sister in Christ – not just people who fill the seats during worship services or attend your church’s programs. Don’t use people as instruments to advance your agendas or gratify your desires. Instead, build genuine personal relationships with them simply to know and love them for who they are. Ask God to help you love your congregation like family members. Encourage them to see each other as family members, and act with compassion, mercy, and forgiveness toward each other. * Consider whether or not you should overlook the offense. Know that some minor offenses should just be overlooked. When deciding whether or not to overlook an offense, ask yourself: “Who sinned?” (Sins are more serious if they’re committed by Christians who know better than by nonbelievers who don’t know better, and by authority figures such as parents, teachers, and church leaders than by those who are not positions of authority. ), “Against whom?” (Sins are more serious if they openly dishonor or mock God, or if they’re committed against someone in authority, in close relationship to the person who sinned, or a weaker person. ), “What is the nature of the offense?” (Consider such issues as whether or not there was a malicious motive behind the sin; if the sin was acted upon rather than just expressed in attitudes or words; and whether or not the sin was committed publicly, deliberately, or frequently. ), “What were the circumstances?” (Consider how serious the time and place of the sin was. For example, was it committed during a Sunday worship service?). Also consider whether or not the person who has sinned is trapped in persistent sin and needs your help to find freedom, and whether or not the offense is hindering the relationship between the person who sinned and the person who has been sinned against. If you choose to overlook an offense, make a proactive decision to forgive the offender and not pursue any form of correction or admonition. * Discuss the issue with the goal of reconciling. Get the conflicted parties together and encourage them to talk about the issue with the intent of restoring their relationships as brothers and sisters in Christ. Urge them to genuinely listen to each other’s perspective, and to listen more than they speak. Help people make sincere confessions to each other – confessions that are characterized by real repentance instead of just regret, and which demonstrate humility, reverence toward God, and kindness and gentleness toward other people. Encourage people to enlarge their perspective so they’re not just focusing on the problem, but looking beyond it to see God at work, guiding them toward a solution. Teach people to make clear confessions by: addressing everyone involved in the conflict, not adding qualifiers like “if,” “but,” and “maybe” to their confessions, admit their sins specifically, accept the consequences of their actions, alter their behavior, ask forgiveness, and allow time for the offended party to forgive. Help people grant true forgiveness to each other. Don’t cheapen forgiveness by urging offended people to forgive without addressing the offenders’ sins. Realize that forgiveness is not a therapeutic form of self-help to make the people involved feel better. Know that it is a work of the Holy Spirit restoring people to right relationships with God and each other. Help people recognize the seriousness of sin, but also take God’s promise of forgiveness seriously. Teach people that when they forgive someone, they make four promises: “I will not think about this incident,” “I will not bring it up and use it against you,” “I will not talk to others about this incident,” and “I will not allow this incident to stand between us and hinder our personal relationship.” Urge people to deal with their attitudes toward the people who offended them, as well as taking specific steps to reconcile with them. * Negotiate. Think and pray about creative options to resolve the conflict in a way that honors God and is best for the people on both sides of the conflict. Ask God to give you the wisdom to do His will. Look out for other people’s legitimate interests instead of just your own, and seek to promote the welfare of everyone concerned. Prepare well for negotiation by praying, gathering all the facts, identifying the issues and concerns of each party, identifying desires, seeking godly counsel, developing options that might be agreeable to people on the other side of the conflict, and anticipating the reactions and objections of the other party and try to preclude them by biblical and reasonable answers. Affirm your relationships with everyone involved by speaking the truth in love. After you have come to understand and honored people’s interests and searched for creative solutions, evaluate your options objectively and reasonably. Invite people to make respectful appeals if they’re not satisfied with the results. Ask God to help you deal with difficult people who act like your enemies by continuing to act in love toward them despite their difficult behavior. * Pursue meditation or arbitration. Help people who cannot reach a successful resolution to their conflict themselves. Consider meditating their dispute (acting as a third party to help them reach a mutually agreeable settlement, by giving biblical counsel that helps shape their decisions) or arbitrating it (acting as a judge empowered to make a binding decision for them). Remember that peacemaking isn’t a task reserved for lawyers or other secular professionals; God has called the church to help its members work out their conflicts. Be sure to clearly explain to everyone involved what the meditation or arbitration process will entail, make sure they’re treating each other respectfully and equally, and guide them to a satisfactory result. * Exercise church discipline. When your church’s members persist in sin and refuse to heed the counsel of your church’s leaders to repent, help them come to repentance by holding them accountable. Don’t be afraid to discipline members who act in defiant and reckless ways that harm their relationships with God and others in your congregation – such as a husband who has an adulterous affair and abandons his wife and children. Realize that disciplining someone is actually a way of caring for that person, because the goal is to help that person grow. Keep in mind during the process that you should honor God, improve the church’s health, and encourage the sinner to repent and be restored to fellowship. Whenever you discipline someone, be humble, take the sin’s destructive power seriously, express compassion from a shepherd’s heart, and keep in mind that the person involved is a part of God’s family with you. * Incorporate an emphasis on peacemaking into the life of your church. Emphasize peace in your worship services by urging people to confess their sins to each other, forgive each other, and treat each other like brothers and sisters. Preach about how God helps people work out their conflicts. Sing songs that have to do with peace, unity, forgiveness, and reconciliation. Use Scripture passages that deal with peace and related issues. Regularly pray for peace in your church, and also for the marriages, families, work environments, schools, neighborhoods, etc. of those in your congregation. Use the sacraments to emphasize peace, such as by having the congregation promise to look out for the interests of people who are being baptized, and by urging people to resolve their outstanding conflicts before taking communion. Train your church’s leaders in how to be peacemakers. Encourage people attending your church to become members committed to living in a covenant community with each other, keeping the unity of the Spirit through the bond of peace. Adapted from The Peacemaking Pastor: A Biblical Guide to Resolving Church Conflict, copyright 2006 by Alfred Poirier. Published by Baker Books, a division of Baker Publishing Group, Grand Rapids, Mich., www.bakerbooks.com. Alfred Poirier is chairman of the board of Peacemaker Ministries and serves it additionally as adjunct instructor and mediator. He is senior pastor of Rocky Mountain Community Church in Billings, Mont.